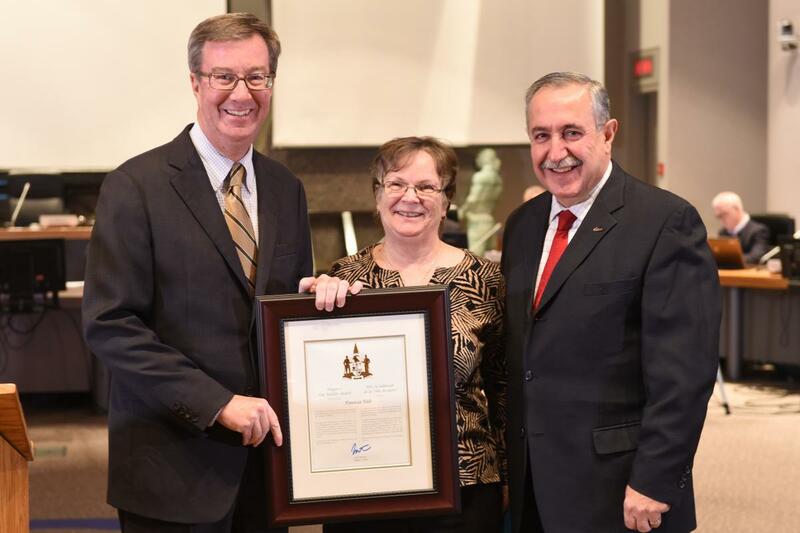 Mayor Jim Watson and Councillor Eli El-Chantiry presented the Mayor’s City Builder Award to Patricia Tait today in recognition of her 20 years of community activism in West Carleton, notably her volunteer work with Ottawa Riverkeeper. Mrs. Tait has been an active volunteer for over 20 years helping to maintain the Morris Island Conservation Area, and has been monitoring the health of the Ottawa River near Chat Falls Dam for 10 years as one of 50 River Watchers for Ottawa Riverkeeper. She took a lead role in the work to find an ecologically friendly solution for shuttling boats around the Chat Falls Dam. The boat bypass, at Mohr’s Landing next to the Quyon ferry dock, opened in July 2006. In 2009, she received the Daniel Brunton Outstanding Volunteer Award from Ottawa Riverkeeper. She is a community leader who helps residents on both sides of the Ottawa River to understand why protecting the river is important, and what they can do to help. She is often seen at community events in West Carleton–March wearing her Riverkeeper t-shirt, spreading her knowledge and passion for clean, healthy and sustainable waterways – always with a friendly smile. She’s also an enthusiastic volunteer with the West Carleton Food Bank food drive, the Arnprior and District Food Bank and the Friends of the Carp River.